Short post here guys but hopefully helpful to those of you who love to whine about Apple and their requirement for a DUNS number. I have probably read 5 articles over the last month saying people have waited weeks or months or even just “Gave up“ on getting a DUNS number so they could submit their apps to Apple. As someone who has always been characterized as both resourceful and impatient I found what I suppose some will call a “hack” several years ago to get a DUNS number for free AND do so quickly (like within one business day). Yes, it is, and you saw that job that fit your company perfectly on their website, remember? 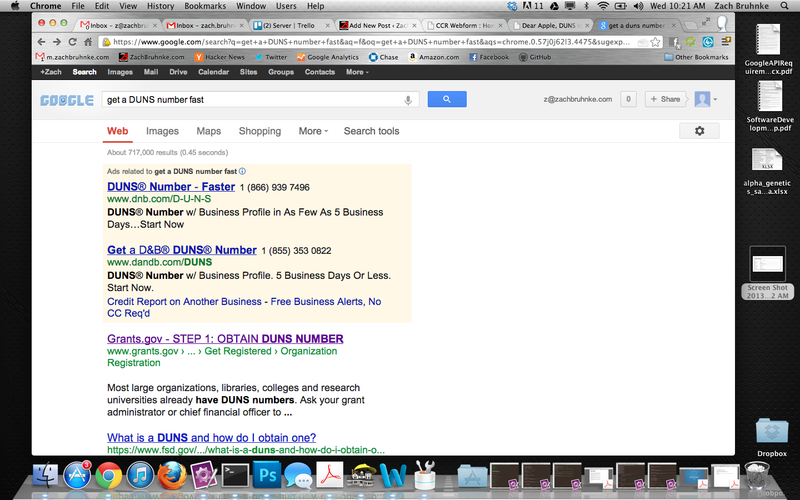 And then after you got your newly minted DUNS number for FREE and you realized maybe it was not such a good fit? Oh that’s a shame, because now you have no Government contract and just a lowly DUNS number which can be used any time it is needed for any purpose someone would need a DUNS for. I wonder how you’ll ever make use of that useless number now? This is what you would do if you had spent your precious time and frustration doing if you had learned problem solving skills in school. What a bold search that was! You’re welcome, and good luck in business though in my opinion you’re probably better off sticking to your day job. On the other hand if at some point in the future you have found this article via Google or DuckDuckGo etc. I commend you. Thanks for being the difference you want to see in the world! Did this article offend you? Make you happy? Make you sad? Feel less resourceful? You’re welcome to tell me by commenting on Hacker News if you so desire. You are currently browsing the General Business category at Zach Bruhnke.